Llandovery is a market town in Carmarthenshire, Wales, lying on theRiver Tywi and the A40/A483 roads. The town is served by Llandovery railway station, where there is a park and ride to Llanelli andShrewsbury via the Heart of Wales Line. Llandovery - a corruption of ' Llanymddyfri', meaning 'Llan ymlith y dyfroedd' or in English 'Church enclosure amidst the waters' - owes its name, to its position between the River Tywi and the Afon Brân just upstream of their confluence. A smaller watercourse the Bawddwr, runs through and under the town. Llandovery is twinned with Pluguffanin Brittany, France. The Roman fort at Llanfair Hill to the northeast of the modern town around was known to theRomans as Alabum. It was built around AD 50 to 60 as part of their strategy for the conquest ofWales. A Roman road heads across Mynydd Bach Trecastell to the southeast of Llandovery bound for the fort of Brecon Gaer. Another heads down the Towy valley for Carmarthen whilst a third makes for the goldmines at Dolaucothi. 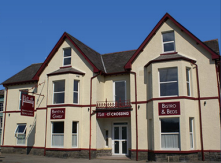 Recently renovated throughout: Welsh Tourist Board 5* bed & breakfast accommodation. A warm welcome awaits guests new and old, at The Drover’s, our exquisitely refurbished, 17th century Grade 2 listed guest house located in the Market Square right in the centre of Llandovery in Carmarthenshire. This lovely, welcoming town is the ideal base from which to explore the surrounding region and The Drover’s (Welsh Tourist Board 5* rating) provides the accommodation required to complete your enjoyment of the perfect weekend, short break or holiday. The Drover’s B+B is, indeed, the ideal base from which to enjoy the many year round activities and attractions on offer in Llandovery and the surrounding area. Featuring a Jacobean interior door and with our woodburner adding to the warmth of the welcome in the visitors lounge and William Morris themed decoration to the overall ambience, the scene is set for a memorable stay as we introduce guests to The Drover’s impressive facilities. Our award-winning Hostel, Bistro and Bar provide good quality accommodation, food and value for money, with a warm Llandovery welcome from Sally and her team. We are a business with a social difference - encouraging new visitors to Llandovery, whilst providing jobs & training for our community. Delicious homemade food is available to evening visitors as well as our overnight guests. We are flexible and provide simple Mediterranean-style food plus hearty steaks, pies, even curries for those who are extra-hungry. If you are a group, we are very happy to provide meals & dishes to share. The bistro is open every evening, and we serve paninis & light snacks at lunchtime. Freshly-prepared tapas & pizza available every Friday & Saturday night.